Dog doors can be a beneficial addition to any dog owner’s home. The key to getting the most out of your dog door is to choose the one best for your pet and train them appropriately. Using any door in your home, open it to the minimum width required for your dog to walk through comfortably. That distance plus an extra inch or so, should determine the width of the dog door you purchase. It’s also important to take into account your dog’s height by measuring the distance between the highest point of their shoulders straight to the floor. 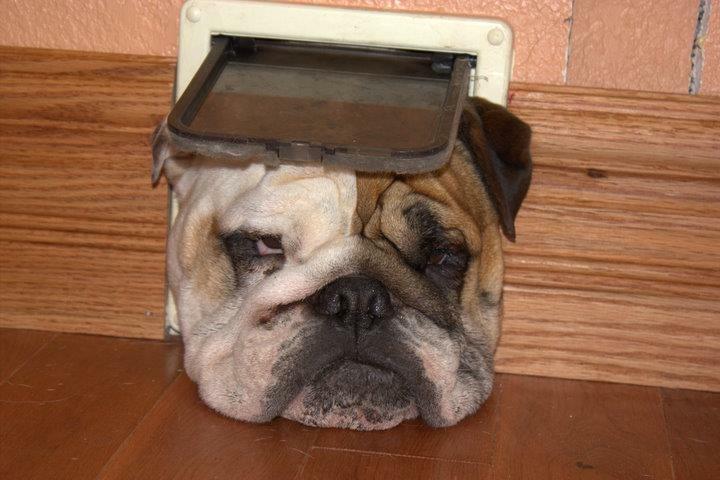 The height of the dog door should be at least two inches greater than your dog’s height. With the right measurements, you can assure your dog can comfortably fit through the door, without rubbing on the door when they pass. The last thing you want is to install a door your dog can’t even fit through! Note: If your dog is a puppy, it’s best to wait until they’ve reached their full size before installing a door, otherwise you take a risk by estimating. There are lots of types of dog doors, some meant for sliding glass doors and others not meant for doors, but for walls made of stucco or brick! They come in all different materials too, including plastic and aluminum. If you live in an area where it either gets really cold or really hot, you may want to consider purchasing a dog door that has multiple flaps meant to protect your home from outside temperatures. These types of doors are energy efficient, with weather tight seals. Not all of us are handy, and although there are certainly more difficult projects than installing a dog door, there is such a thing as an instant doggy door. These types of dog doors are more like panels and slip right into place on your sliding door’s track! Many people are concerned that having a dog door will allow other animals or intruders to get into their home. Some may also not want their dog going outside when they aren’t around, either because they’re afraid the dog will tear up the yard, escape, or perhaps be attacked by a wild animal. These concerns are valid depending on where you live, but thankfully there are plenty of dog doors available that have locking mechanisms, allowing you to control when your dog can access the outdoors. Even fancier, some dog doors use advanced entrance and exit technology that allows only pets wearing a special ID tag to pass through. Although these types of doors are more expensive, they may be worth the cost if it will put your mind at ease. This is definitely the wrong sized door! Now that you’ve chosen the right door for your dog and installed it, the next step is to train your dog to use it. As you probably guessed, the best way to go about doing this is to coax your dog through the door with a treat, and praise them every time they go through. Be sure never to frighten your pet by yelling, scolding, or shoving them through. You don’t want your dog to associate the door with fear, as this will make training much more difficult. For dogs that need a little extra help, you can try holding the flap open all the way or even removing it. Gradually close the flap until they realize they need to use their nose to push their way through to a treat and reward! Some electronic flaps make noises that could frighten your dog. If this is the case you can disable the electronics to allow them to adjust to the flap in general. Think you’re ready for a dog door? Start your search for the right one here.